Folding design makes storage simple and transporting a breeze, while waterproof fabric and frame preserves comfort and durability. Product Description Timberland Glory. 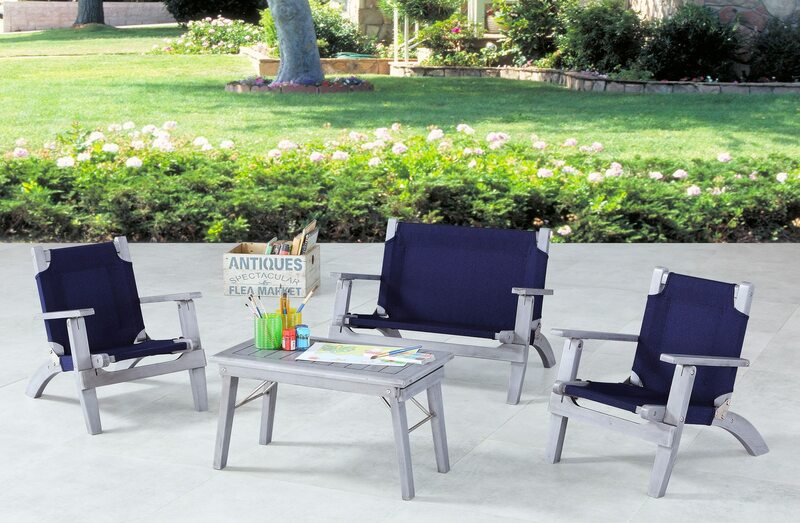 Spirited and full of character, the Nantucket outdoor youth set flawlessly captures the heart and essence of the great outdoors. Natural acacia wood frame keeps close to the outdoor tradition with its back-to-basics aesthetic and strong build. Wrapped over a wooden frame in canvas-style covering, the smooth and weatherproof fabric keeps the outdoors clean and comfortable, without sacrificing style. Customer assembly required. Unique Features: Foldable, organized, and portable for modern convenience. Strong and solid acacia frame maintains stability and durability. Enjoy the outdoors together in a spacious and cozy loveseat. Steely gray has a cool and light tone about, offering a breezy and relaxed atmosphere. Plank-reinforced table design ensures lasting durability against all weather conditions.